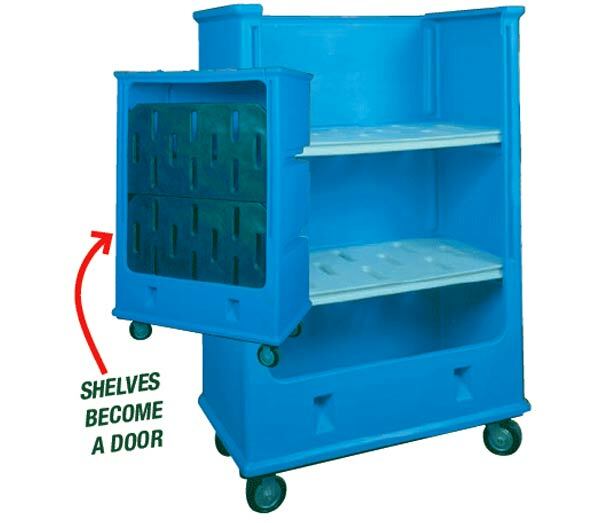 Removable re-inforced plastic shelves drop down to create a secure door. 6" Heavy Duty non marking neoprene casters provide 1500 lb. load capacity. Heavy Duty ribbing ensures maximum durability. Smooth plastic design eliminates chance of linen snags. There is no exposed metal to rust. Seamless plastic provides a sanitary easy to clean surface. Equipped with moulded in handles for easy, controlled movement.